In the Baltic Sea, young European perch don’t know they are filling their tummies with junk food. And so the perch are finding themselves in a nutritional lurch. While these fry (baby fish) are not actually eating ‘fries, they’re eating microplastics – microbeads from health and beauty products, and particles from degraded polystyrene coffee cups, meat trays and other types of marine litter that clutter our oceans. Because of their “zero” nutritional value, it’s safe to say microplastics qualify as “junk food”. But as they’re found in increasing supply in perch habitat, these tempting morsels have become the go-to food for fish when a snack attack hits – and part of their normal diet. Here in North Amercia we’re also surrounded by poor food choices: fast food outlets, and highly processed, packaged foods with white flour, white sugar or artificial sweeteners, trans fats, preservatives, fillers and plenty of unpronounceable additives – often disguised as healthy food. And studies have shown that when we eat fast food, we’re eating plastics, too. Like the perch, we’re drawn away from nutritious whole foods to empty substitutes. And it’s no wonder the acronym for the Standard American Diet – our norm – spells S.A.D. 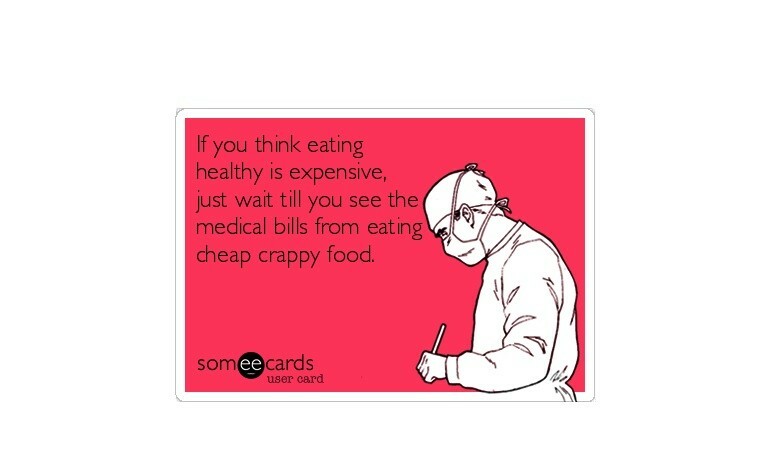 It’s probably fair to say that, for us, poor eating habits are mostly self-imposed. Nutrition labels are prominently displayed on packages, menus, and web sites. And we have vast choice when it comes to filling our plates (often to overflowing). But still, we often choose increasingly tasteless and less healthy options – I know I’m not immune to the siren call of the donut. 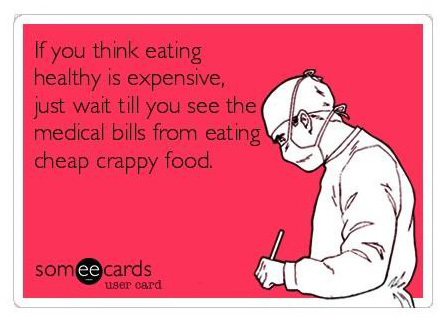 But in countries like Guatemala, the poor have little choice but to eat “junk food”. Not junk food in the sense of fast or processed convenience foods, but foods of such limited variety – and often in such limited supply – that basic nutritional needs aren’t met. Not just for a day or two, but for weeks, months, and even years. According to the study, The Normalization of Childhood Disease: An Ethnographic Study of Child Malnutrition in Rural Guatemala, in many places, people just aren’t aware their daily diet isn’t good for them. But a long history of eating the same thing, and without many or any other choices, it’s “normal”. So it seems odd that with junk food served up as the daily special (in meager or super-sized portions depending on where you live) we “celebrate” Junk Food Day on July 21, and not something out of the ordinary: like a whole day without junk food. 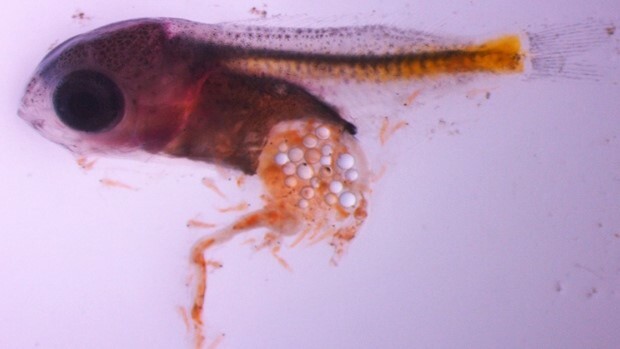 But starting well before they’ve learned to selectively tune out their mother’s voice, perch eggs exposed to microplastics have lower hatch rates. And once they’re old enough to eat – because their diet has the nutritional value of Styrofoam (because it is Styrofoam) – the fish are smaller. They spend more time motionless and swim shorter distances than fish that eat a protein-rich diet of zooplankton. The same goes for kids who mostly eat a high carbohydrate, low protein diet. It leaves them hungry. 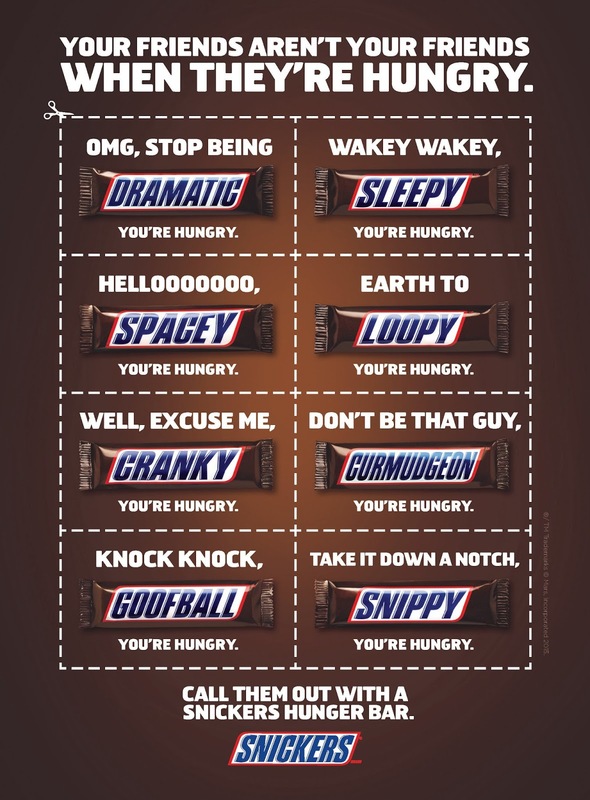 Thanks to Snickers, we know “you’re not you when you’re hungry”. Just as “hangry” people wear their mood on their sleeve, Snickers’ latest ad campaign showed hunger symptoms on the chocolate bar wrapper. With names like Spacey, Cranky, Loopy, Snippy, Sleepy, Goof ball, and Curmudgeon, they sound suspiciously like a new roster of seven dwarves for Snow White. It’s easy to “undo” these short term symptoms: “Call Them Out With A Snickers Hunger Bar”, the ad says, and your hungry friends will go back to normal. But keep eating nutritionally poor food by need or by habit, and you’ll probably find yourself with a case of Feel Like Crap (FLC) Syndrome. Often a side effect of S.A.D. with symptoms like insomnia, fatigue, headaches, brain fog, depression – with possible autoimmune and chronic diseases on the side – FLC has a lot in common with malnutrition. Which goes to show: it doesn’t matter if your tummy’s full; if it’s full crap, you’ll probably feel like crap, too. Even so, in many cases FLC is reversible: stop eating junk foods (detox), and get on the path to better health by changing eating habits. Sure, it sounds like a simple enough solution, but according to USAID, this takes at least two ingredients hard to come by among Guatemala’s rural poor to pull this off: 1) understanding that that food is the biggest factor affecting long-term health and development, and 2) the ability to access and prepare more nourishing meals. Sadly, some communities that grow carrots, onions, strawberries and squash choose to sell them for income instead of eat them, because they don’t know they’re more nutritious than tortillas and beans. But the problem is, “[a] diet of little more than tortillas does permanent damage”. And like our perch on a steady diet of microplastic, many Guatemalan children, are more passive and less responsive to the world around them because of their junk food diet. Unfortunately, there’s a lot more to being short from malnutrition than being height challenged. Stunting has long term, irreversible effects that cast a long shadow throughout children’s lives, their communities, and broader society. As if being a small fish in a big ocean wasn’t enough of a disadvantage, the perch’s junk food diet sabotages their sense of smell. Combined with slower reaction time, this makes them easier prey. And as the perch are eaten by predators higher in the food chain, the stockpile of plastics and toxins in their bodies are transferred to other fish, animals – and ultimately – humans who eat them. In this way, researchers believe the impact of plastic on young fish could have "profound effects" on ecosystems. In the same way, malnutrition imposes long term effects on Guatemalan children: “[I]rreversible stunting dooms children to repetitive illness, inhibits them intellectually and physically, reduces their productivity as adults by roughly a third.” These kids also suffer from learning difficulties and end up poorer, which translates into political instability, social conflict, and violence when they’re teens or adults; spillover effects felt beyond borders by citizens, neighbouring countries, trading partners and tourists. I don’t know about you, but I can’t imagine what $47 trillion looks like. And given the long-term costs of malnutrition, I can’t grasp why junk food is something to celebrate. But a Junk Food Free Day? Now that’s something I can get behind. The more of them the better. And I’m pretty sure Food for the Hungry Canada (FH) feels the same way. Whether it’s microplastics for fish, or tortillas for kids – a regular diet of junk food shouldn’t be the norm. And while fish travel in schools, my hunch is they’re not great learners when it comes to nutrition. But for FH communities it’s another story – a good one, too – and full of hope. 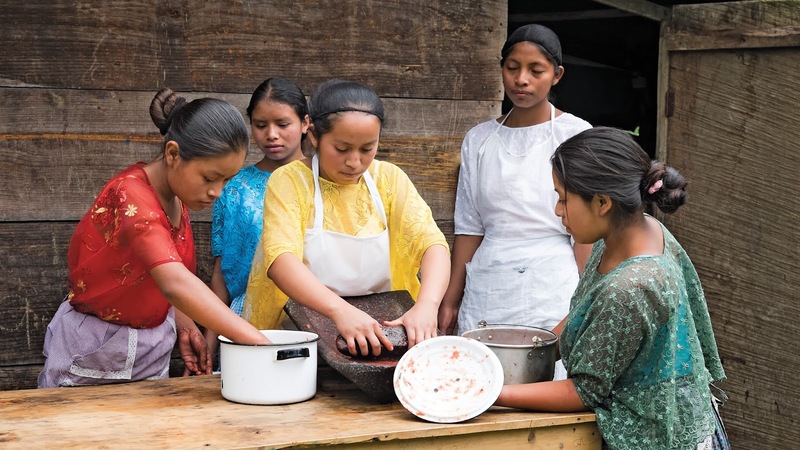 FH is equipping families in Guatemala to change up their daily diet. They’re teaching them how to plant kitchen gardens to grow a local, fresh supply of healthy fruits and veggies for their families so they don’t have to choose between family nutrition and selling cash crops for income. And through FH Cooking Classes, women are learning about the links between health and nutrition, and practical ways to prepare balanced meals; knowledge they pass on to friends and neighbours. The short of it? Happy, growing kids that stay in school. The long of it? Healthy, self-sustaining communities and stable societies. Whaddaya think? Worth the investment? Help a family go junk-food free by joining FH as they provide health and nutrition education to parents, and in some cases even relief aid in the form of dried soup mix and other supplies. Help out today! [i] Mark Hyman, “Eat Fat, Get Thin: Why the Fat We Eat Is the Key to Sustained Weight Loss and Vibrant Health”, (Little, Brown, 2016), p. 4.